Ever looked at the creepy Polar bear of the Birds Eye adverts and thought "that right there is an attractive creature?" Missing the feeling of soft tickling that comes with the spooning that you last experienced what feels like aeons ago? Combine the two and we have your answer! 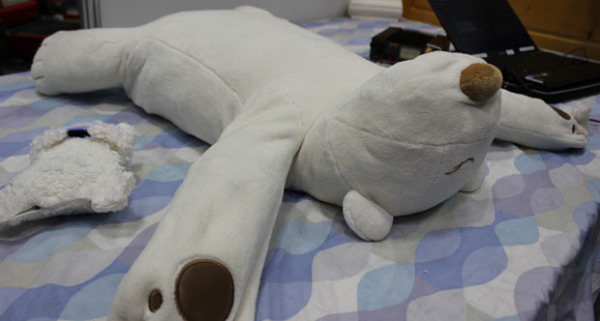 The Jukusui-Kun, a robot pillow disguised as a stuffed polar bear (why not! ), has been designed to tackle snoring and sleep apnea, via a microphone, a conductive panel and a pulse-oxygen meter dressed as a baby polar bear. If anything, at least the design motif is consistent! The cuddly toy monitors snoring and blood oxygen levels, and activates once one of these reaches a pre-determined level, initiating a tickling maneuvre applied to the head (not that head), causing the sleeper to roll over, bringing normalised breathing back to the person. It was developed at Waseda University's Kabe Lab, and has been shown to the public via a very serious man who just makes the whole process of a small robotic polar bear tickling a man in a suit on the forehead that little bit more out-of-left-field. Why a polar bear? Why a polar bear that looks that creepy? Hang tight people, this could probably be one of our more strange reviews.